IBM® Worklight® Application Center is an enterprise application store. It allows you to install, configure, and administer a repository of mobile applications for use by individuals and groups within your enterprise or organization. It is built on top of the IBM MobileFirst Platform and the IBM Worklight mobile application platform that enables you to develop, deploy, and manage mobile applications. 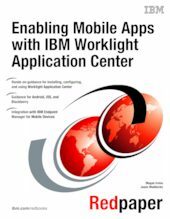 This IBM Redpaper™ publication provides detailed step-by-step guidance on how to install, configure, and use Worklight Application Center. It provides instructions for installing mobile applications (apps) into Application Center, and for browsing, installing, and rating those apps through the mobile client running on an Android, iOS, or BlackBerry smartphone. This paper also positions Application Center next to the Enterprise App Management component of IBM Endpoint Manager for Mobile Devices, and describes how to integrate the two solutions. This IBM Redpaper is of interest to those who are looking to understand, implement, or use an application store in their own enterprise.